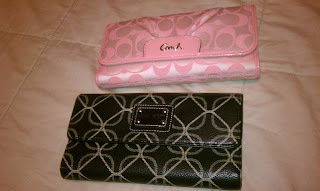 I found a better replacement for my old (yet reliable) Nine West wallet. It is a wallet from Coach. It is almost the same inside as my old NW but better because of the big C's lol. Just kidding! It is better because it is new. I have had the older wallet for years now and I have been wanting a new one with a detachable check holder so the wallet and the check holder will match. They do match, perfectly. I am happy with my purchase. Thanks to the ever generous husband.